3 1/2 stars out of five. I was somewhat disappointed. It didn’t seem to live up to the promise of the title, and the overall positive high rating that people gave it. Still, I did read it from cover to cover. It was not very easy reading; I don’t think it was very well written. There was a lot that was anecdotal; and study after study was cited, by researcher after researcher. Sometimes I just wanted her to state her opinion, already! The first few chapters seemed to almost be an apologia for the dominant paradigm of extroversion. I did like the fact that she points up the strengths and weaknesses of both types, though; avoiding simplistic answers. 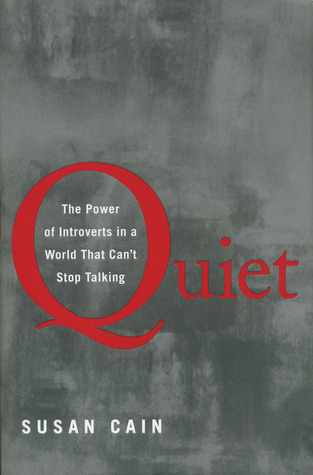 I do recommend this book, especially for those that think they are indeed introverts. The concept of empowerment for introverts instead of stigma is a good one; as well as the analysis of different personality strengths and weaknesses. I especially liked the information on the physiological basis that is thought to be a factor in these matters. Although it didn’t seem to delve too deeply into what to do as an adult if you have this personality trait – despite all the ballyhoo, I didn’t emerge with a clear sense of pride or empowerment – the author does offer some practical suggestions into the parenting of an introverted child. Such as the suggestion not to label the child with a stigmatic prognosis of ‘shyness’. This is a book that should pique your interest and lead to further reading. Speaking as a proud introvert (our dirty little secret is that we’re quietly arrogant), I wouldn’t change for anything. Haven’t read the the book, and probably wouldn’t, but there’s a TED talk she gave on the subject, and I’ll probably watch it now and stick it on the blog. Nice to see you back in full flow, Amy.